You’ve probably heard this 23 times in the past two weeks, but here it is again: Xerocon London 2018 is just around the corner! It’s typically an insanely busy few days, so with our trades focused hat on we’ve come up with a list of things that should be at the top of your “to do” list if you want to do more for your trade based clients in 2019. Firstly, if you haven't already, you need to check out the Trade and Construction app playbook (click here to view). The playbook maps out the most popular add ons, who they are best suited to, how you can quickly go through a needs based assessment with your clients and what the next steps look like to ensure a great outcome for the client, the firm and the add on. Being familiar with the playbook and the apps contained within it pre Xerocon means you can spend some time today thinking about which apps are likely to be best suited to your clients and which apps you would like to learn more about at Xerocon. If you’re not already MTD migration certified then attending the MTD workshop is probably the highlight for Uni Day. MTD presents a massive opportunity for you to help your clients in the trade and construction sector start leveraging cloud based tools to simplify and streamline tasks that cause unnecessary angst and distraction. Using MTD as a lever to get your clients onto Xero will help them save time, reduce their compliance costs, help you and your firm position monthly fixed priced billing and present an opportunity to upsell bookkeeping and business advisory services. Once they are loving Xero then positioning and integrating Tradify will be a walk in the park. If that sounds useful then the MTD workshop is the place to start. Check out the rest of the Uni Day agenda here. Once you’ve checked into the hotel and sat through a Uni Day workshop, you’ll no doubt find yourself thirsty and in need of conversation and refreshments. Luckily, Xerocon has just the ticket. From 6pm you’ll be able to mingle with delegates, speakers and exhibitors at the Xerocon Welcome drinks. This is a great way to get your registration sorted and it provides a great opportunity to quickly scope out all the exhibitors so you know exactly where your targets are based in the exhibition hall. With your trade and construction clients in mind you’ll want to make sure you leave some quality time for Tradify but there are plenty of other add ons that will do a world of good for your clients such as Float, iwoca, Receipt Bank, Chaser and Expensify. Then once you’ve done that then I guess it will be time for the legendary Practice Ignition or Receipt Bank parties. If you’ve checked out the agenda for Day 1 you’ll know it's all about the key notes. The stellar line up includes Xero stalwarts Gary Turner, Steve Vamos, Ed Berks, as well as Lucy Adams, the inspirational Ben McBean and others. Very rarely would you get to listen to a line up like this so it probably makes sense to attend as many of these sessions as possible. If you feel like maybe you've become a bit complacent recently or you're wondering where to head next then I would recommend Ben McBean's session at 4.15pm on Day 1. If I had to pick one more I would recommend attending Gerd Leonhards session on technology and humanity, as I suspect there will be some interesting points into how relatively traditional professions i.e. accounting and trades, come to terms with the changing dynamics of a totally connected digital first world. Gerd has some fascinating insights and you can learn more about him here. There are ample breaks so you’ll have plenty of time to start working through the exhibitors building relationships, stealing swag, and getting demos as you go. At the end of day 1 there will be the awards ceremony, more time to network with the exhibitors and other attendees and then it all wraps up with an incredible after party that can't be missed. Check out the full agenda for day 1 here. So if all that wasn't enough, there is still another day to go! For any firm with trade and construction clients that’s early in its app advisory journey then the must attend session on day two is the 10:00am Keynote on Ecosystem apps presented by Nick Houldsworth, Executive General Manager - Ecosystem & XLLP. There is also a breakout session at 12.20pm focused on the App Playbook which sounds like it could be well worth attending. There are plenty of other great sessions on Day 2 such as Sir Chris Hoy at 3.15pm but for me Day Two is all about spending quality time with exhibitors such as Tradify. Taking this opportunity to learn more about who their product works best for, what their partner model looks like and understanding their local support capability means you’ll have made the absolute most out of Xerocon London 2018 for your trade and construction based clients. Check out the Day Two agenda here. 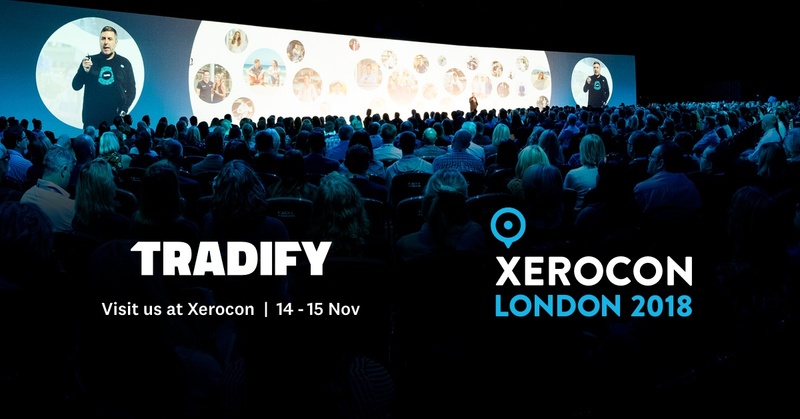 From experience I can tell you that to really reap the rewards from Xerocon London 2018 you need to start implementing your key take outs the moment you step back into the office. Before you start clearing the mountain of emails waiting for you, take a moment to sit down and write your top 3 lessons from Xerocon and the 3 things you are going to do to make the most of those learning's. Hopefully mentioning Tradify to your clients in the trade sector is the top of your list. If that sounds like a possibility, make sure you pop over to our stand and say Hi!